It is no secret that I am a chocolate lover. In fact, who am I kidding? My name is Stuart, and I am a chocoholic. With Easter fast approaching and supermarket shelves stacking up my colourfully foiled friends (or foes?) higher and higher with each passing day, I’m finding it hard to think of anything other than chocolate! So why not turn a little distraction into big inspiration . . . The chocolate palette has been a magical ingredient in interior design schemes the world over and across many different style tastes for centuries. Evoking warmth and bringing richness to any space and many an accessory, a delicious addition of chocolate implies a true sense of luxury. From rich tanned leathers to soft possum throws, we really can have our cake and eat it too with the limitless choice of chocolate tones, finishes, fabrics, furniture, textures and accessories on offer. Feeling inspired by my love of all things chocolate, here is my recipe for the perfect chocolate interior, making them almost good enough to eat! Chocolate stained timber floors throughout our Greenknowe Avenue project lends a moody, masculine feel to this bachelor pad. The use of dark chocolate veneer alongside lighter white stone in our Bourke Street bathroom creates a classically crisp and clean finish with an added layers of richness and warmth. 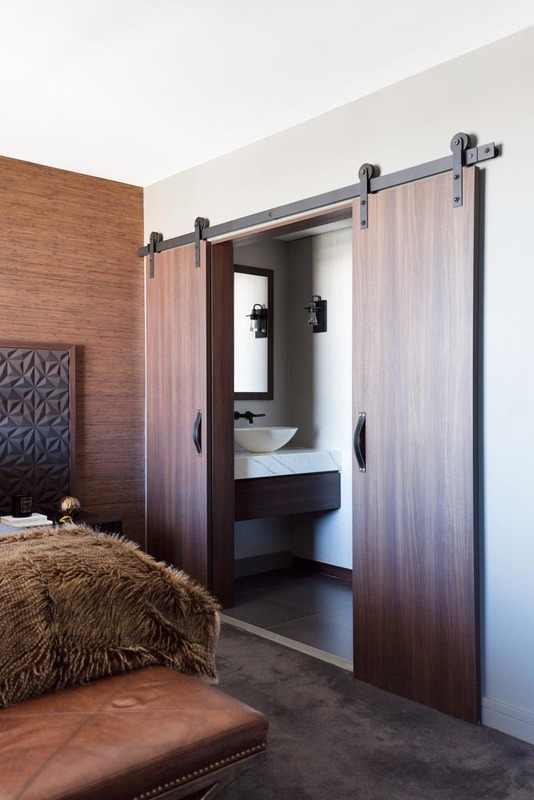 Chocolate coloured wood makes a bold statement moving from the master bedroom to master bath in our Bourke Street 2 project. Although very solid and heavy, the use of timber adds a naturally rich and warm texture to the spaces, softening the masculine lines. Tan coloured leathers lends a subtle softness to the surrounding darker tones in our Bourke Street 2 study. And since we’re talking about all things chocolate, it would be remiss of me not to share Architectural Digest’s Top 10 Best-Designed Chocolate Shops Around the World aka my Bucket List! However, if chocolate is not your poison, then why not treat yourself to a luxury getaway over the Easter long weekend? The amazing Seidler House in the Southern Highlands of New South Wales will do me just fine. Now all I need is a chocolate fondue fountain with extra strawberries . . .